Horse reins: Want to improve your riding? Improve your hands. This is how! Horse reins are objects to be grabbed, leaned on, yanked, or pulled. They are a line of communication between you and your horse. Some years ago, I was an invited speaker at a meeting of the American Riding Instructors Association. In his talk to the Association, George Morris, the famed jumping instructor and competitor, used the term "educated hands" to describe this concept. In order to get the most from your riding--whether it is dressage, jumping, or hacking out--develop "educated hands", hands that feel the horse's mouth. MAGINE YOU ARE A HORSE. The most important from the horse's point of view is the way the rider communicates with the horse's mouth. When riders hold the reins incorrectly, they end up losing connection with their horses and (too often) punishing their mounts unintentionally. Here is the most common error and how to correct it. COCKED OR FLATTENED WRISTS: Many riders hold the reins with their wrists cocked or flattened. If you hold your reins in either way, you will find yourself pulling and see-sawing on your horses mouth with unfeeling, dead hands. The result will be one very unhappy horse with a very hard mouth. Your horse may duck behind the bit to avoid that “dead feeling” or lean on your hands to try to stabilize all that unpleasant movement. 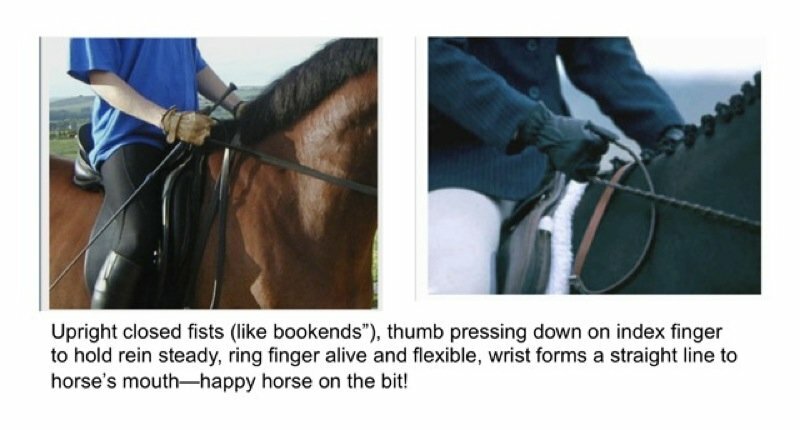 THE CORRECTION: If instead you want your horse to be consistently “on the bit”—face on vertical and steady contact with the rider’s hands--try holding the reins this way: Position your wrists vertically (like bookends) and close your hands into fists so that the rein is held steady between the thumb and forefinger while your ring finger “feels” the horse’s mouth.